The reopening the controversial Panguna copper mine in Bougainville, an autonomous region of Papua New Guinea, is in doubt. The anti-mining movement led to a ten-year war in 1989. A court case against Rio Tinto failed. The mine at Panguna was opened in 1972 and majority-owned by Rio Tinto. It was important to the economy of Papua New Guinea, but the people of Bougainville were seeing little benefit from it. The first Bougainville independence movement arose in the late 1960s, as people aired their grievances against the Australian colonial government over the handling of the Panguna mine. Later, after Papua New Guinea became independent of Australia, Francis Ona from Bougainville warned in August 1988 that patience was running out. He established the Bougainville Revolutionary Army (BRA): that "the only way is for us to shut the mine". Powerlines, transportation, the telecommunications station and the international air terminal were blown up. By the end of 1988, the mining operation had been forcibly halted. A survey in late 1989 indicated that at least 1600 homes had been destroyed. The decade-long conflict erupted after demands for compensation for environmental damage by landowners living in the vicinity of the Panguna copper mine in the mountains of central Bougainville were unmet. The mine, majority-owned by Rio Tinto, a British-Australian multinational, had opened in 1969 and was operated by its Australian subsidiary, Bougainville Copper Ltd, BCL, until it was shut down in 1989 by revolutionary forces. The conflict raged on for another eight years after the Papua New Guinea Government blockaded Bougainville in 1990 and the national armed forces and rebel groups battled for control of the region. In January 1990, Bougainville Copper announced the mothballing of the Panguna mine. The Papua New Guinea government with Australia and mercenary troops as allies started a war against Bougainville. Conservative estimates put the number of combat deaths as 1,000 to 2,000 during the ten years of so-called "crisis". Other sources state that the 10-year civil war between Bougainville revolutionary forces and the PNG military led to widespread destruction on the island and an estimated death toll of up to 20,000. 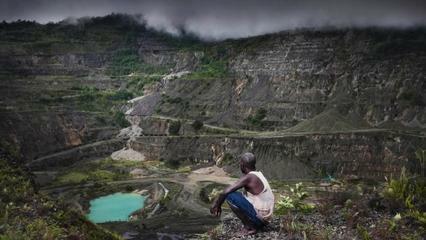 Residents of the island of Bougainville in Papua New Guinea (PNG) later filed suit against Rio Tinto under the 'Alien Tort Claims Act' in a US federal court in 2000. The plaintiffs alleged inter alia that environmental impacts of Rio Tinto's Panguna mine harmed the island's environment and the health of its residents and that Rio Tinto was complicit in war crimes and crimes against humanity committed by the PNG army. Friday 28th June 2013 s ruling by a majority of an 11-judge panel of the 9th U.S. Circuit Court of Appeals ended litigation begun in 2000. Rio Tinto Plc won the dismissal of a nearly 13-year-old U.S. lawsuit accusing the Anglo-Australian mining company of complicity in human rights abuses. In 2016, Rio Tinto Plc finally said it is walking away from the closed copper mine on the South Pacific island of Bougainville that was at the center of a decade long civil war. No liability has been recognized. Project Details Work at the mine was suspended in 1989 and has not been restarted. Estimated $8 billion cost to return Panguna to its former glory. Rio Tinto Zinc RTZ Mining and Exploration Ltd. (RTZ) from Australia - Owner of over fifty per cent of the Panguna mine. Sued for human rights abuses. Sold out in 2016. The mine was closed for many years, the independence movement was defeated, Rio Tinto has escaped paying for environmental liability. Why? Explain briefly. Friday 28th June 2013 ruling by a majority of an 11-judge panel of the 9th U.S. Circuit Court of Appeals ended litigation begun in 2000. Rio Tinto wins against claims for human rights abuse. The opening of the mine at Panguna is still under discussion. The war against Papua New Guinea was lost.